HDFC was among the first few banks in India when it launched mobile banking apps for its customers. Initially, HDFC mobile app was port of their existing mobile banking site. But nowadays the HDFC Bank offers a native and full-fledged suite of mobile apps which allow customers access almost all netbanking features on their fingertips. Given below are the new features of HDFC iOS (iPhone) and Android apps and the ways to download them. HDFC bank lists a lot of applications in the iOS app store and the Android Play store. If you are using a new-age smartphone and have a good internet connection, use the following links to get an app version for your device. Download HDFC Bank mobile app for iPhone, here. Download HDFC Bank mobile app for Android, here. The mobile version of the HDFC Bank website accessible at m.hdfcbank.com is an alternative if you have a problem with the above apps. If internet connection is poor or not available, you could also use the LITE version of HDFC Mobile banking for basic operations like balance checking. The new versions of HDFC Mobile banking app for iPhone and Android incorporate UPI and some other mobile-only features that you won’t find on HDFC netbanking portal. HDFC app for iPhone and Android offers the following features in its newest version. These settings are available when you log in to the app with your HDFC netbanking username and password or the mobile banking PIN (MPIN). 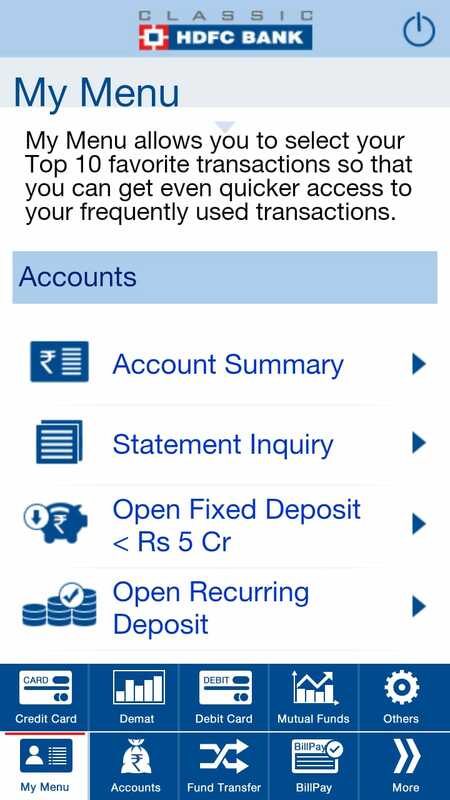 Accounts: This section of app includes options to manages your savings bank account with HDFC Bank. Account Summary: Get the basic information and balance amount in your HDFC Bank SB account. BHIM HDFC Bank: Option to create a new VPA (user ID) for your UPI transactions. View Account Statement: Check the detailed transaction history of your HDFC account. Cheque Status: View the status of the cheques issued under your HDFC account number. Fixed Deposit Summary: Summary of your FD accounts with HDFC bank. Open Recurring Deposit: Start new RD with HDFC Bank. You can select the tenure and Installment amount with the app. Liquidate Fixed deposit: Option to break or stop and withdraw your FD amount on your mobile device. Super Saver : A special FD in HDFC Bank that lets you convert a part of SB balance, above a limit, to Fixed deposits. You could also transfer funds for your FD account to SB account. This option lets you enjoy FD interest rates, and availability of funds in needy situations. Generate, Retrieve and Cancel MM ID for IMPS Transactions. Email Statement registration and Reregistration. View or Update Aadhaar Card Number. Third Party Funds Transfer: Various options to transfer and receive funds comes under this section. Between my account: Fund Transfer between accounts linked to your Customer ID. Within HDFC account: If the receiver has an HDFC Bank account, you could use this option to make instant fund transfers. View Details of IMPS or RTGS Funds Transfer. IMPS Instant Transfer to Other Banks using MMID or IFSC Code. Pay via Visa Card Pay. Add Beneficiary: You should add a new beneficiary before you could transfer funds. This option lets you do that on HDFC Mobile banking. View or delete list of existing beneficiaries. Credit Cards: If you have an HDFC Bank credit card, this is the place to access unbilled statement, make payments, etc. Account Summary: Here you could find your HDFC Credit Card’s Total Credit limit, available cash and credit limits. Download Credit Card Statement: In the new version of HDFC mobile banking there is option to download an check HDFC Credit card bill on iPhone and Android phones. Credit Card Payment: Pay your HDFC Credit Card Bill amount. You can pay the bill for registered and other HDFC Credit Cards though mobile banking app. If you want to pay for Insta Jumbo Loan, you may choose Other HDFC Bank Credit Card option to make the monthly installment (EMI). View unbilled Transactions: Option to check your unbilled credit card transactions and after the last statement date. Register a new Credit Card: Use this menu to activate your new HDFC Credit card online. There is also a de-registration option. 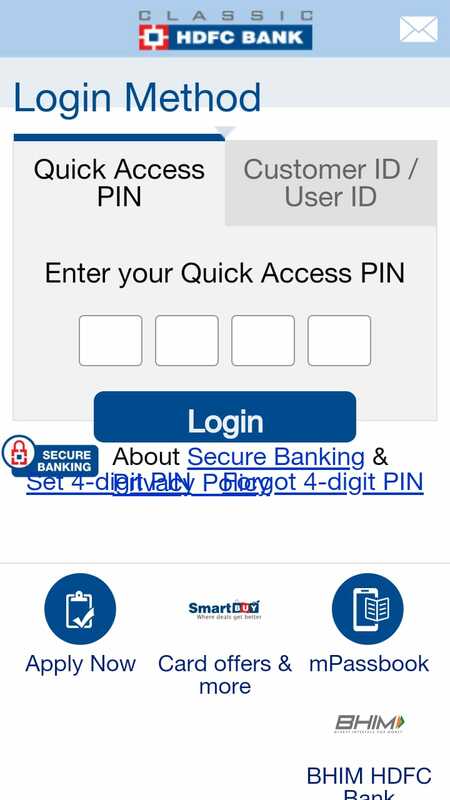 Instant PIN generation: This section of HDFC Mobile Banking app allows you to change your credit card’s ATM PIN. Autopay registration and de-registration: Use this setting to pay your HDFC Credit Card bills; you could select to pay the minimum r total due amount the account number from where it should be debited. Bill Payment: HDFC Bank’s Bill Payment service let you automatically pay your Broadband, Gas, Insurance, Landline (Postpaid), Mobile Postpaid, Electricity, Water bills, subscriptions, Tax, Mutual Fund, and Rental payments easily from your Savings Bank Account. Biller Addition and Deletion: Select this menu to add new biller or delete an existing one. You have to register the mobile number or DTH account number before you could do the recharge through this platform. Unfortunately HDFC Bank don’t support Reliance Jio in this service. Demat: If you have a stock trading account with HDFC Securities, and hold a DP account, take this menu to view your holdings and the current value of your investments. Holding Query: Lists stocks in your account. List of Account: Shows your HDFC Securities DPID, Account number, etc. Client Profile: Includes details of your accounts with HDFC Securities, like the address, Demat account’s client ID, account opening date, Dividend account and charges debit account. Transactions statement: Allows you view stock buying or selling activities through HDFC Securities. Debit Card: Manage your HDFC Debit Card settings in this section. Debit Card Hotlisting: Block your HDFC Debit card form your mobile banking app using this option. Instant PIN Generation: Instantly change the ATM PIN for HDFC Debit Card using this option. Mutual Fund: If you have Mutual Fund account with HDFC Bank, the mobile banking app lets you handle all basic operations on the go. Account Summary: The latest fund value of your mutual fund account with HDFC Bank. New Fund Offer: Details of newly launched fund options available for you. Unit Holding statement: Details of the number of mutual fund unit you hold. Others: Some account and app related settings of of HDFC Mobile Banking app comes under this menu. View your contact or address details. Change your address given in the HDFC Bank Savings Bank/Credit Card/ HDFC Securities account profile. Alter your HDFC netbanking or Mobile Banking account login password. Update the Quick Access PIN for your mobile banking app. Quick Access PIN De-registration: Use this option if your see the error message “You have already registered with some other device”, and cant use MPIN to sign in to HDFC mobile banking. Manage Insta Alerts: You could set SMS or e-Mail alerts for various transactions linked to your HDFC SB account. The best thing about HDFC mobile banking app is that you could configure the menus in the home page as per your liking. Click on the Blue Personalize button in the app to add quick links to above given sections. are already registered with some other device. As said earlier, you see the above options when you login to HDFC Mobile Banking app. However, there are some other facilities HDFC provide outside the logged-in page. You could see a lot many options as you launch the HDFC mobile banking app for iPhone and Android. It is possible to set a Quick Access PIN for easy login to app. There is also an option to reset this PIN if you forget it, providing debit card details and OTP verification. Quick links to Apply online for HDFC Personal Loans, Car Loans, Two Wheeler Loans, Life Insurance, General Insurance, Gold Loan, Credit Card, NRI account, Savings Account, e-Gift Card, Forex Card, Home Loan, Trading Account, SmartHub, and Fasttag. BHIM HDFC Bank: Although you could Create a new UPI VPA within the HDFC mobile banking app interface, the complete UPI options are available outside the app. Click on the BHIM HDFC Bank link to access the UPI facilities like Pay, request money, Balance Inquiry, block or unblock VPA, Generate QR code to accept payment, de-register UPI profile, change UPI PIN, and view UPI payment requests and transaction history. mPassbook: HDFC Banks mPassbook gives you a quick access to your HDFC Bank Savings account transactions and statement without login or internet connection. SmartBuy: Lists various offers available when you purchase or transact through HDFC Bank Credit and Debit Cards or Internet Banking. Although HDFC Bank offers a comprehensive mobile banking app for its customers on iOS and Android platform, some facilities are still missing when you compare it to the online netbanking. For example, the option to download password-less HDFC Credit Card statement is not there in HDFC mobile app. Another thing is the non-availability or redemption system. You have to login HDFC netbanking to redeem the reward points accumulated on HDFC credit and debit cards.